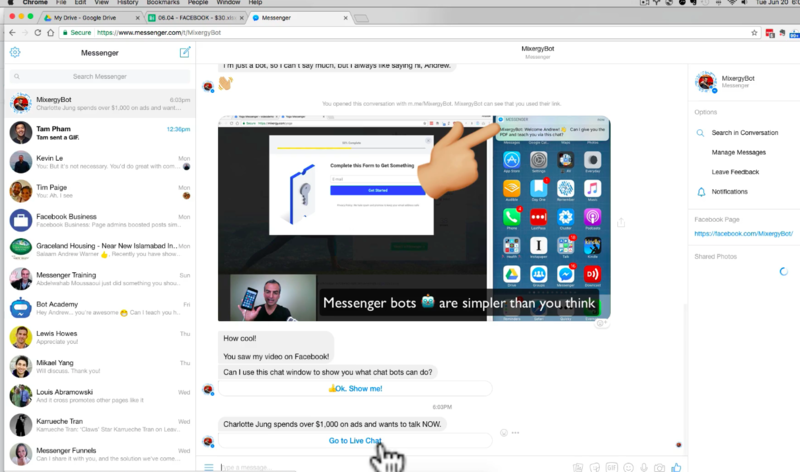 We talked to one of our clients who wanted a chatbot and he said how he could see how it could grow their sales. We suggested that he drip out content and teach his audience first. 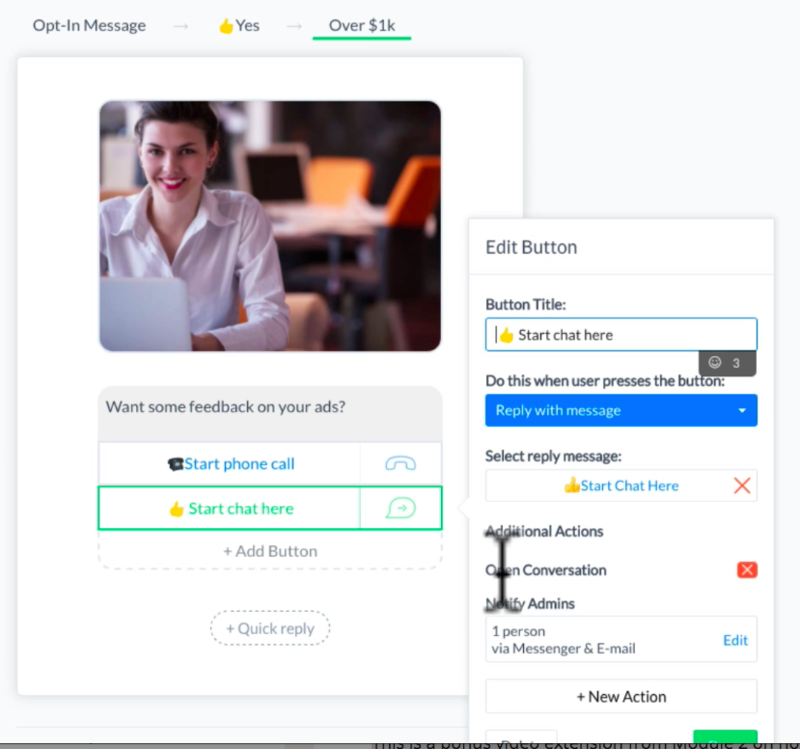 Build the relationship and sell later on in the sequence but he stopped us and suggested that before we drip any content, he wanted us to know that he had some potential customers who are so valuable that he just want to get them on the phone with one of his sales people. 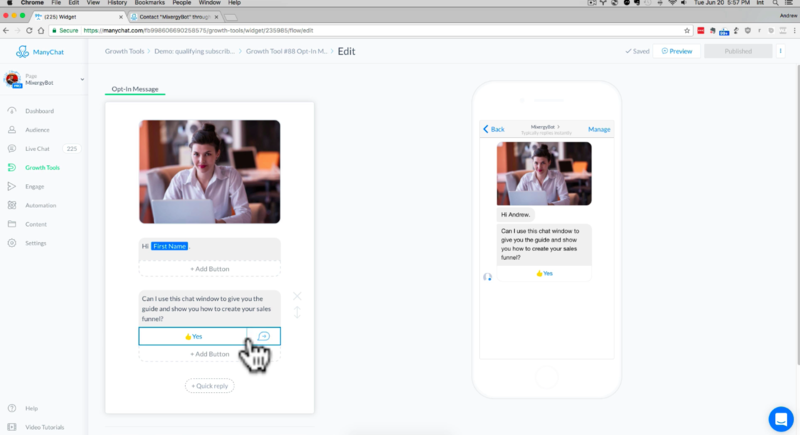 This video shows you how to use a chatbot to qualify your customers so that you can send them in a different sequence based on who they are or the information they tell you. 1. This is a simple landing page created with Manychat.com. 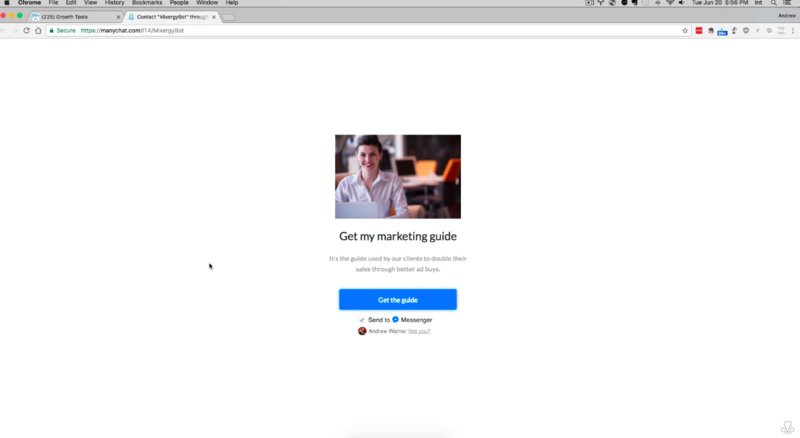 We will be using this page as a demo for teaching how to qualify leads. 2. 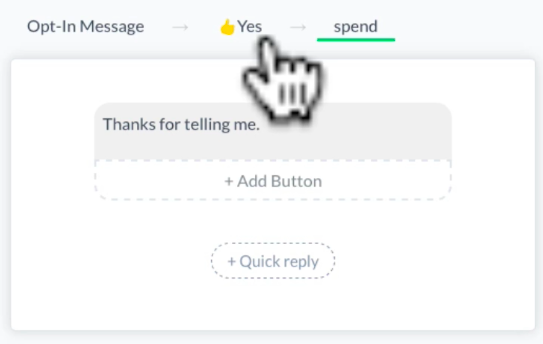 On the back end, you can go to “Growth Tools” and select your landing page growth tool, then click on Opt-In Actions => Edit to edit your message. 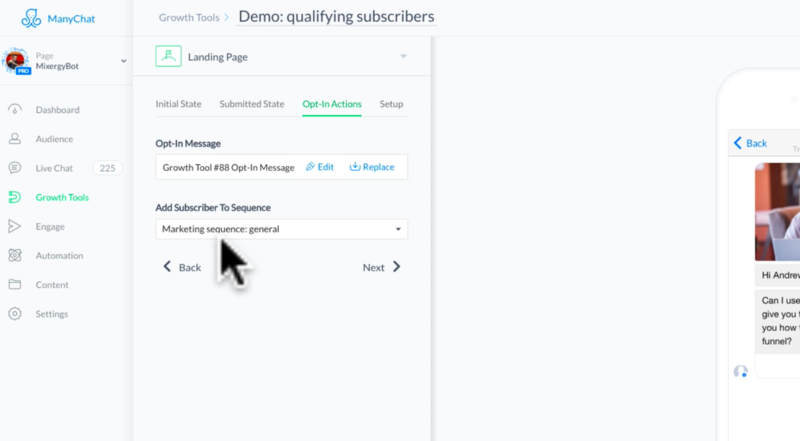 Also notice how everyone who opts in through the landing page gets automatically subscribed to our general marketing sequence. 3. 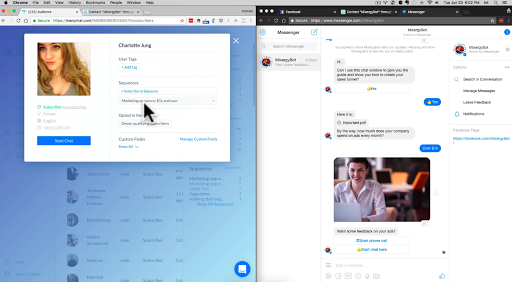 We greet the user by their first name and ask their permission to connect with them via Facebook Messenger, kind of like a double opt in you do to confirm your email address. 4. After they give us permission, we give them what we promised, then start to qualify them. 5. 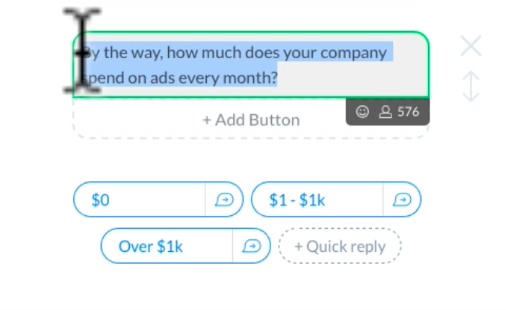 Our goal is to talk to users who spend more than $1,000 on ads every month. So we ask them how much do they spend and based on their answer, we will respond accordingly. 6. 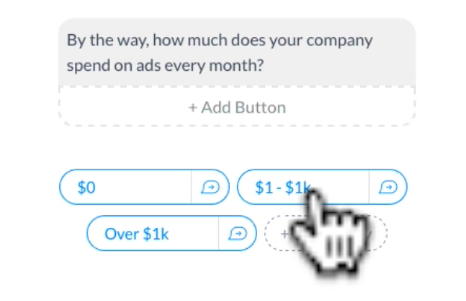 If they click on $0, we thank them for the answer and they continue to be in the marketing general sequence we had subscribed them to in step 2. 7. 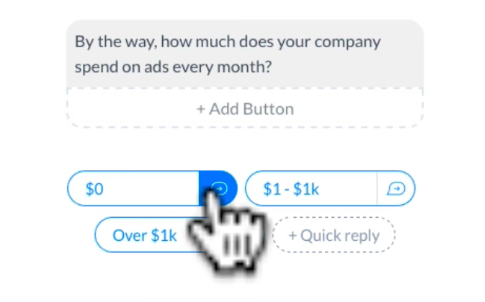 If they click $1 – $1k, we thank them for their answer and keep them in our general marketing sequence. 8. 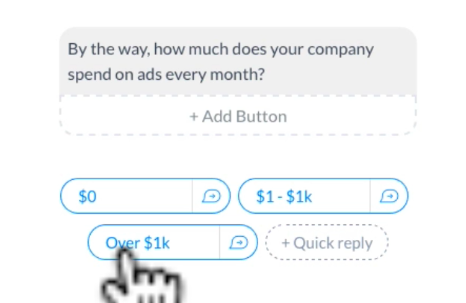 If they click on “Over $1k” then we want to talk to them as soon as we can because that is the market we are going after. 9. They can start a phone call automatically or they can start to chat on Messenger with one of our sales representatives. 10. 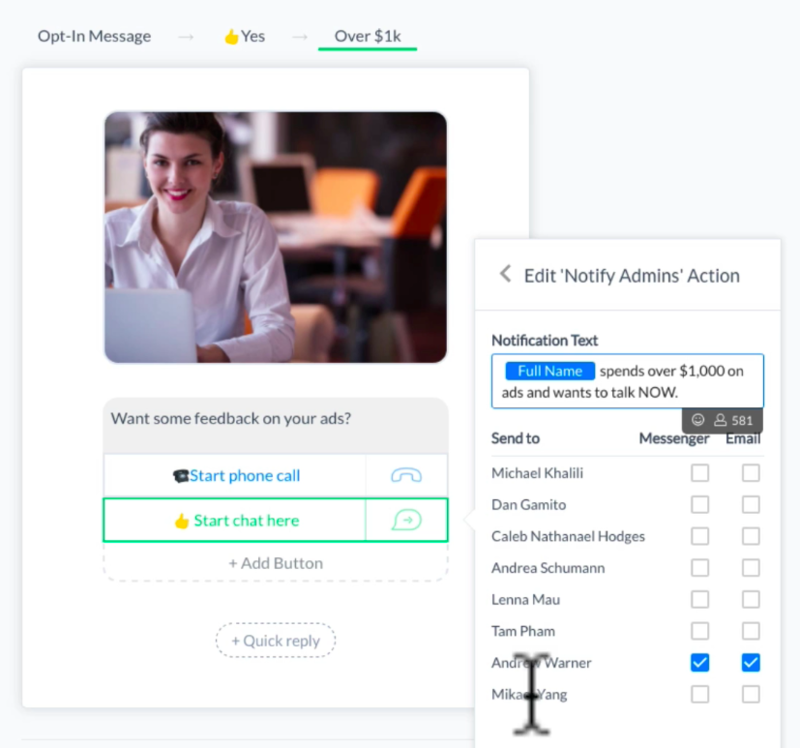 Under Actions, we are going to click “Notify Admins” so that someone from our team can jump in and chat with our qualified lead. 11. 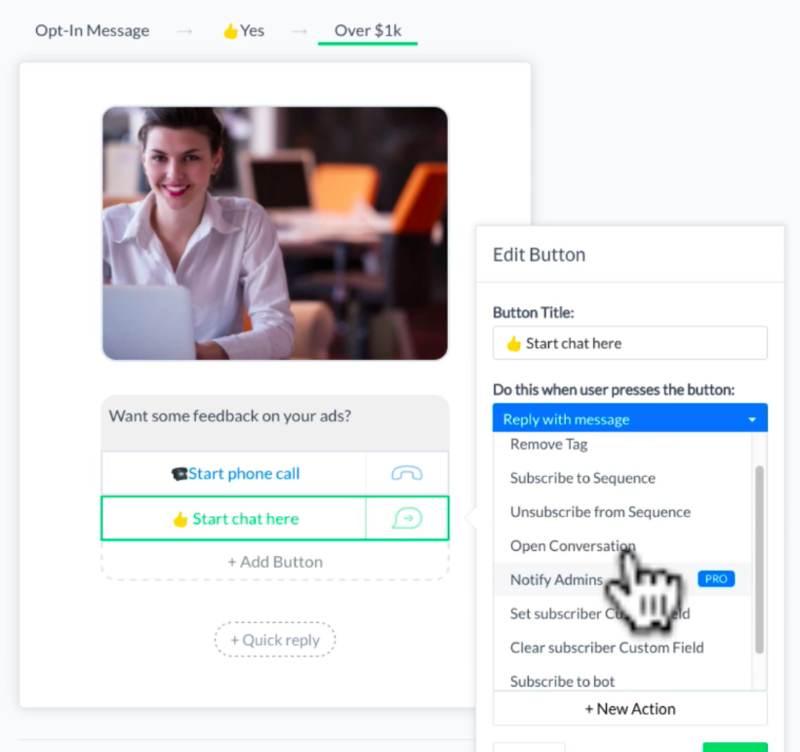 When you get more advanced and have multiple growth tools running with the Notify Admins feature on, you want to specify in the “Notification Text” what the sales rep needs to know to help your customer. 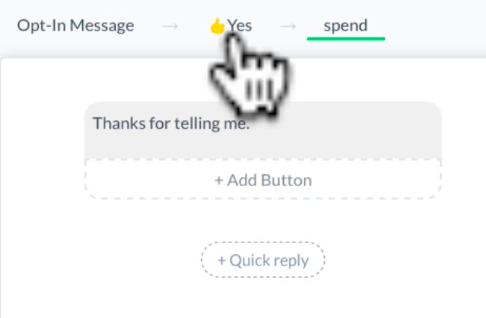 You can also specify who to message for each growth tool so that Andrew is in charge of the ad project, for example, and I (Tam) can be in charge of anyone who wants to talk about content. 12. 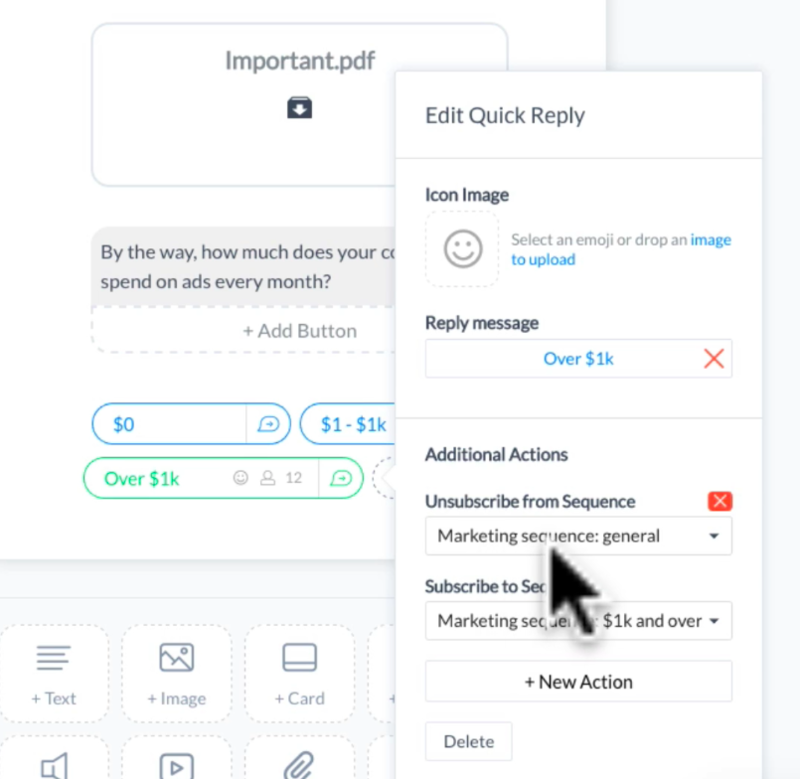 Another advanced tip: Once they click “Over 1k”, we are going to unsubscribe them from our general marketing sequence and subscribe them to a $1k and over marketing sequence. This gives us a chance to created add more value and gives the user the most relevant information for their situation. 14. BAM. Manychat unsubscribes Charlotte from the General sequence and subscribes her to a new one. Are you still with me!? 15. Once Charlotte clicks $1k and over” this is what it looks like on the admin side. 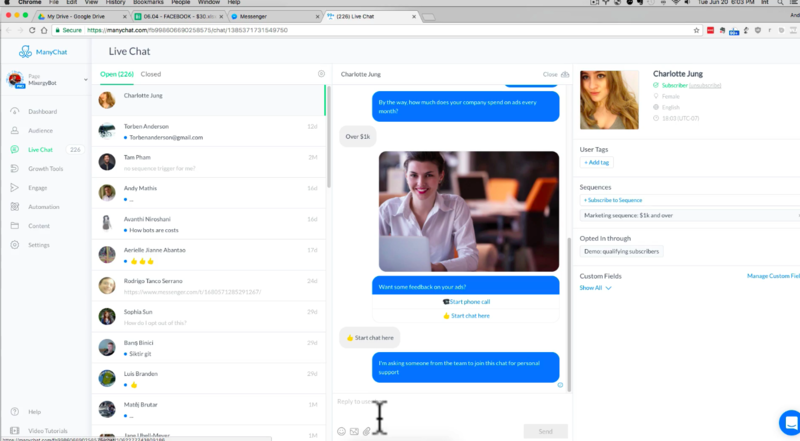 We get notified through Messenger (and email) to jump inside and talk to our customers. 16. It opens the Live Chat on Manychat and BAM we see who Charlotte is on the right hand side. We can see how she opted in, what sequences she is in, and any tags she might have. 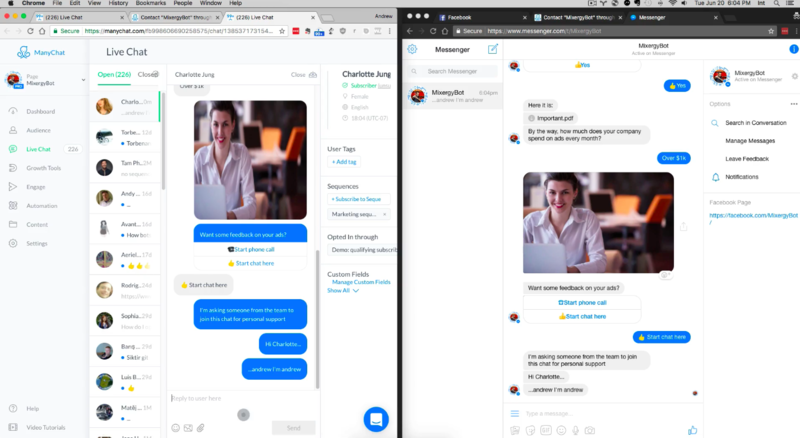 Charlotte is a dummy account we created – when the chatbot is created properly, all your users will have plenty of tags and often opts in to your chatbot multiple times for different bonuses. 17. 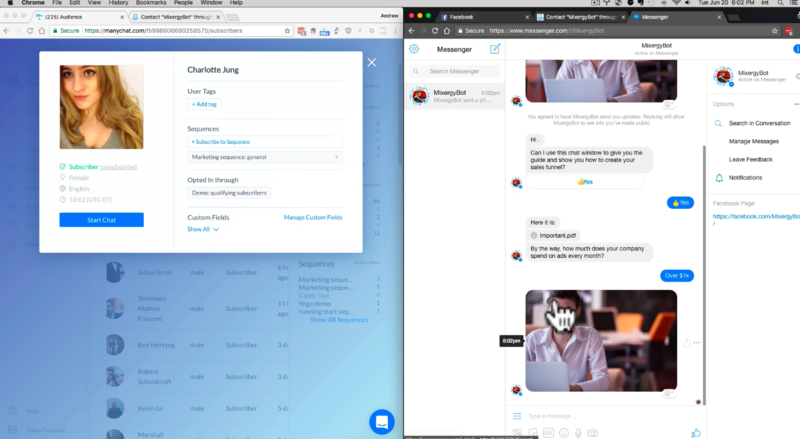 Once you type in on Manychat, it delivers immediately to Charlotte via Facebook Messenger. 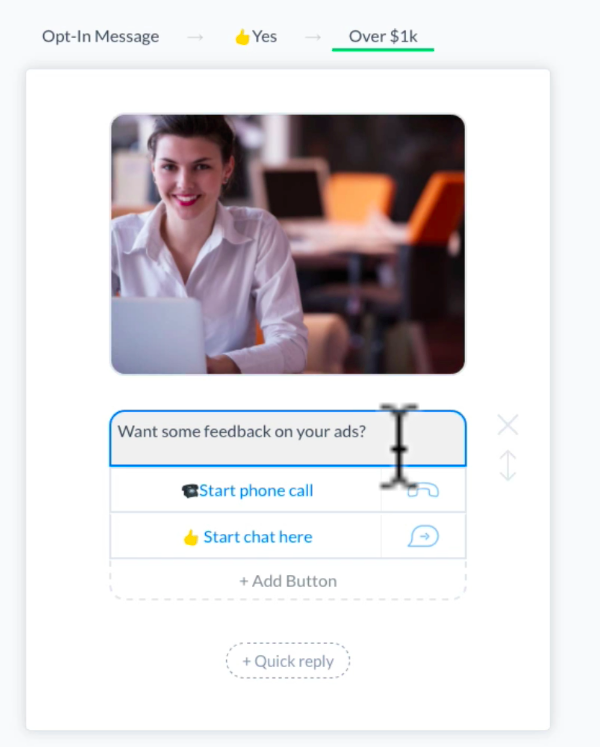 Now you can talk to your qualified leads and close the sale! 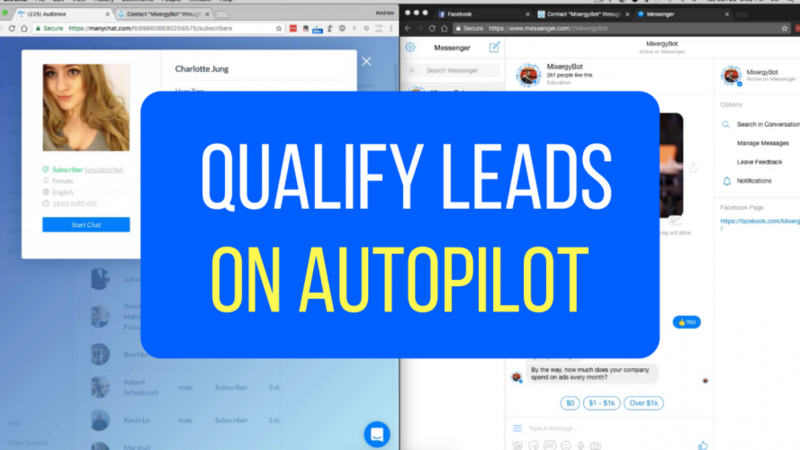 This is the simplest way to qualify leads with chatbots. 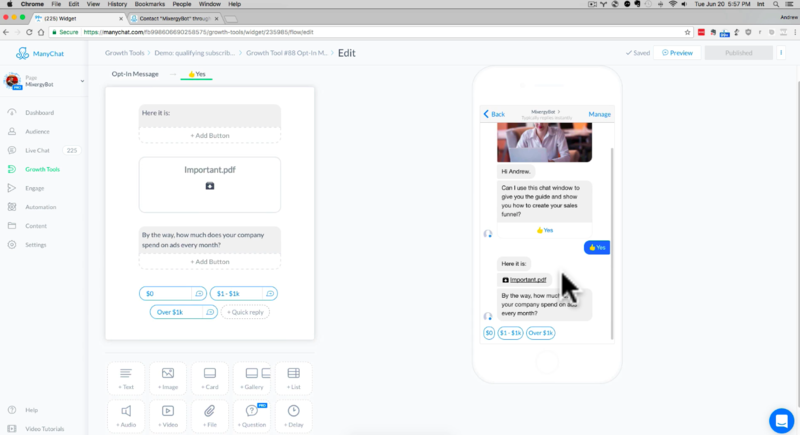 We go much more in-depth in our Bot Academy course. Good luck with your sales and marketing!